Information assurance security focuses primarily on information in its digital form; however, it also encompasses analog or physical forms. IA is important to organizations because it ensures that user data is protected both in transit and throughout storage. Information assurance has become an important component of data security as business transactions and processes consistently rely on digital handling practices. Risk assessments help organizations identify vulnerabilities capable of allowing threats to impact an entire infrastructure, individual systems, or business processes. An information assurance risk evaluation provides knowledge about the probability of a threat exploiting an asset's vulnerability as well as the potential impact it could have from a cost, business operation, compliance, or technology perspective. A reliable, objective risk assessment allows organizations to develop an information assurance management plan for mitigating, preventing, or eliminating potential threats. Information assurance also involves utilizing methods for early vulnerability detection. This helps an organization discover potential software defects or vulnerabilities prior to implementation. An assessment provides insight as to what improvement opportunities exist and specific automated solutions may be used to continuously monitor information assurance efforts. How does your organization currently analyze risk and what measures are being taken to eliminate information assurance issues? Static analysis is, by far, the most impact form of code quality evaluation, enabling detection of critical defects prior to live releases. To perform this process manually, an organization must dedicate extensive developer time to read each line of source code. This does not guarantee that every defect will be identified and does not address implementation issues across multiple application layers. 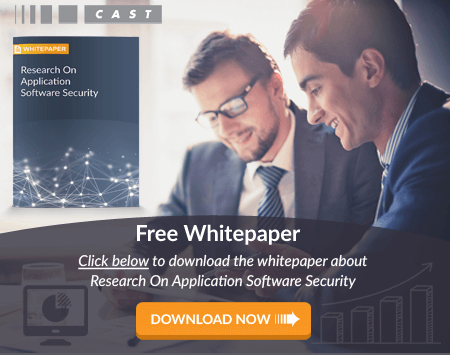 CAST Application Intelligence Platform (AIP) is an enterprise-class analysis solution capable of assessing unexecuted source code during any point of development. Using CAST AIP, your organization will be able to determine current code quality and complexity, and analyze software functional size. CAST AIP can identify harmful vulnerabilities in the most complex IT environments, regardless of the mix of languages or technologies within your entire application system. If information assurance practices need a little boost to ensure a secure, reliable development process, then contact us today to learn how CAST can help your architects and developers better meet these needs. Click here to learn more about CAST AIP.